User Account Management allows you to search for an account in order to access a user’s account management tools. Click User Management, then click the role for the account that you are looking for. Click a user's name to access all of the user account management tools. To register staff accounts as site webmasters in SLS2, see Add Site Webmasters. The Member Search is a quick way to find any user at your site. Type the ID, email address, or last name in the Member Search then click Go. This is a good way to find withdrawn students, because students without a schedule do not show in the Students list, but can be found with Member Search. 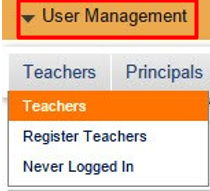 Sysadmins can auto login to dropped student accounts and use the Prior Schedule button to see their grades.